A German court has given a five-month jail term to a 34-year-old man who gave Hitler salutes during a protest in the eastern city of Chemnitz. The man, a Chemnitz resident, attended a big far-right protest on 27 August, prompted by the fatal stabbing of a German man in a brawl with migrants. Nazi signs and symbols, including the Hitler salute, are illegal in Germany. On Thursday the Chemnitz court gave a suspended eight-month term to a 33-year-old man for making Hitler salutes. He was also ordered to pay a €2,000 (£1,780; $2,326) fine. The man jailed on Friday had a string of previous convictions, including for physical violence, so a suspended term was ruled out. 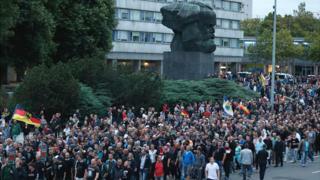 Chemnitz has seen a series of far-right demonstrations – attended by thousands – and smaller leftist counter-demonstrations since the stabbing of Daniel H on 26 August. Two male asylum seekers – a Syrian and an Iraqi – have been detained in connection with the killing. Police are searching for a third suspect, who is also a migrant. There was outrage in Germany over assaults and racist insults linked to the Chemnitz protests. Far-right groups, including the main opposition party – Alternative for Germany (AfD) – are furious that more than a million asylum seekers who reached Germany in 2015-2016 were allowed to remain. On Wednesday Chancellor Angela Merkel told parliament that “there is no excuse or reason for hunting people down, using violence and Nazi slogans, showing hostility to people who look different, who have a Jewish restaurant, for attacks on police officers”. Last week more than 60,000 people attended a free concert in Chemnitz to protest against the far right.